Lately I’ve been convicted that I should buy fish from Australia or New Zealand rather than anywhere else that isn’t as concerned about water pollution as we are. So that has meant the cost has gone up a bit and I’ve been thinking about ways of making a smaller amount of fish feed my growing family. 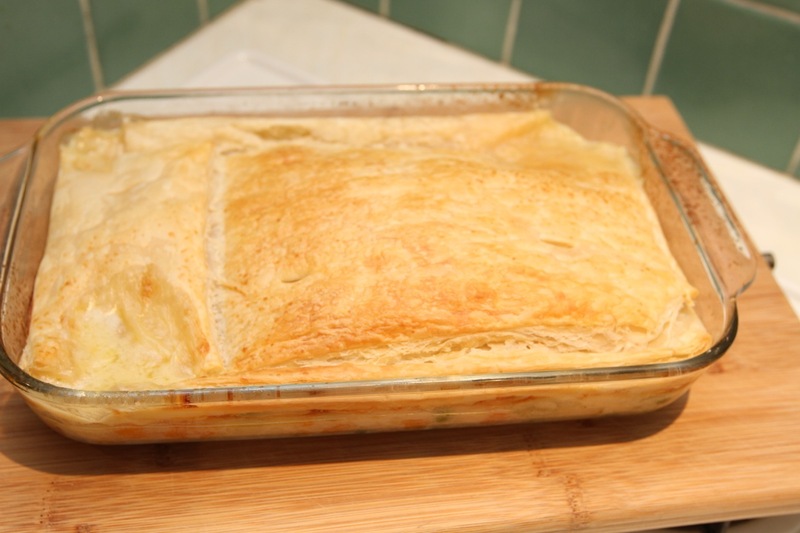 I love pies (mainly I love the pastry…) and so I tried making my first ever fish pie. I had a browse of a few recipes to get the idea of ratios and vegetables that went well and then made up my own according to what I had. I couldn’t quite believe how delicious I found it! – Preheat an oven to 200C (180C fan-forced). – In a frypan or saucepan, fry off the onion, celery and carrots in some olive (or other appropriate) oil until the onions are translucent. Add in flour and mix in. Then add the stock and coconut milk, stirring well as you pour in to create a white sauce (ie it should be thickening but you don’t want it super thick). Bring to simmer. – Add in potatoes and cook on a low simmer for 10 mins. – Add in the fish around now – I did it at the same time as the potatoes and then realised I probably shouldn’t have given the difference in how long they take to cook… thankfully trevally doesn’t seem to overcook in this! Add salt and pepper to taste. Keep testing the potato and when they are tender take the pot off the heat. Place in a pie dish (You can see in the photo I used a rectangular pyrex dish) or individual ramekins. – Prepare the puff pastry – allow to defrost enough to cut into shape and place on top of pie mixture. I found 1 sheet covered my dish easily but I do love my pastry so I doubled it…! I had some leftover pie mixture, enough for 1 ramekin, so the off cuts of pastry went on top of that one. – Cook for approximately 20mins until the pastry is golden (It took longer for mine as I don’t have a fan forced oven and it only has a bottom element). Tip – Pie will freeze well – Allow the mixture to cool a little before putting the puff pastry on. Then cover and freeze. I froze my little ramekin and then had it for lunch yesterday – it was fabulous for lunch. Of course it needs cooking for longer as it was all frozen so around 35-40mins depending on your oven – you know it’s cooked when pastry is golden and mixture is bubbling. Serve with a side salad or something – I didn’t and we needed more food. You could add homemade fries but there’s already lots of potato, you could add cooked veg like broccoli or corn on the cob.